New details on Mystery Box, splitscreen, perks, and more from Zombies Director Jason Blundell. It’s hard to believe, but this year marks a full decade since the release of Call of Duty: World at War… and along with it, Treyarch’s very first Zombies experience: Nacht der Untoten. The rest is, as they say, history. With a new Blood of the Dead trailer burbling out of the Comic-Con murk yesterday, we put out the call to PlayStation fans for their questions (I snuck in a few, too) and send them off to Treyarch via carrier pigeon. 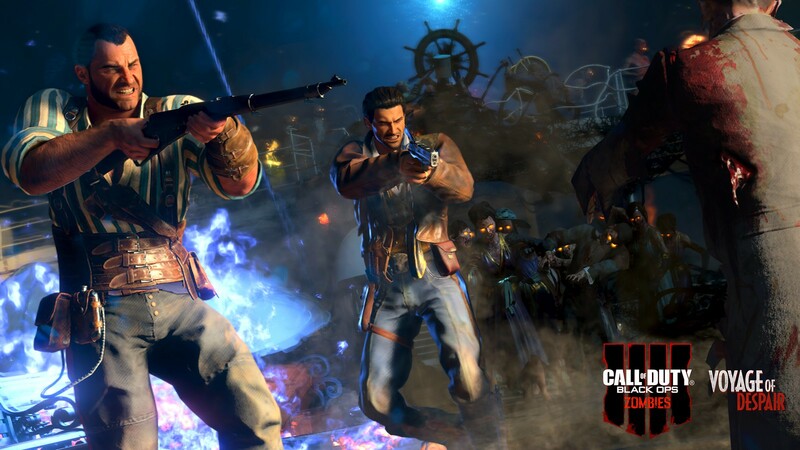 Though Treyarch is traditionally tight-lipped around Zombies details, Black Ops 4 is shipping with three radically different Zombies experiences on day one… so Zombies Director Jason Blundell graciously pulled back the curtain to give us a peek. 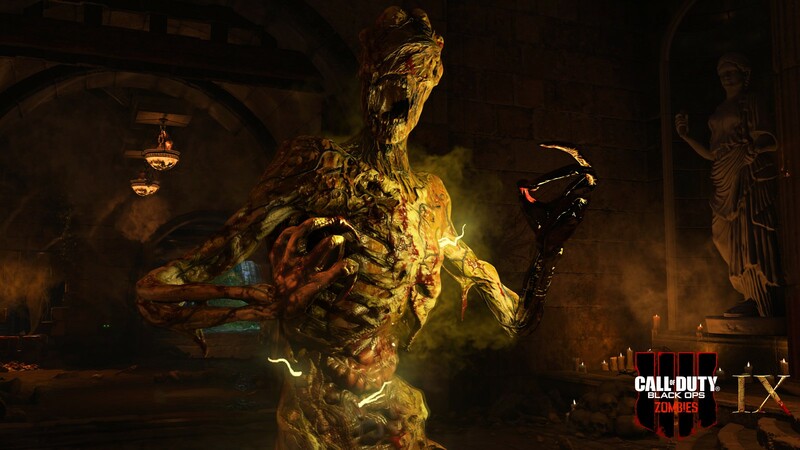 Did Shadows of Evil (Call of Duty: Black Ops III) influence the design decisions or flow of any of the new Black Ops 4 Zombies maps? Jason Blundell, Director, Zombies at Treyarch: Shadows was one of the maps where we really tried to challenge expectations – not just regarding time-period and tone, but also through the sheer scale and variety of the environment. 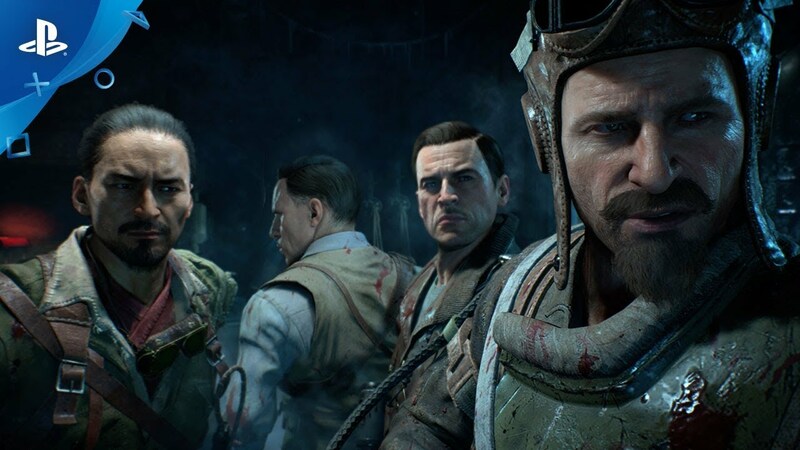 More significantly it was also a new cast of characters, so in that sense, Shadows – along with the original Mob of the Dead – was one of the maps that gave us the confidence to take the narrative outside of the Aether timeline. Voyage of Despair – how does this setting and time period fit into the overall Zombies mythos? It seems like quite a departure. IX is probably the biggest departure we could imagine for a Zombies map. How did the concept of a Roman gladiator setting come together? JB: Again – it’s about moving away from traditional battle locations, and into something visually exciting that we’ve never really explored before. Aesthetics aside, there are of course significant narrative reasons why the characters are there, and what that experience will mean for their individual journeys, and for the story as a whole. JB: Yes. The Chaos and Aether stories are completely disconnected from each other. JB: The new characters are all linked through their respective relationships with an eccentric adventurer called Alistair Rhodes. After he gets into trouble with the game’s antagonists, his daughter Scarlett brings the crew together. As to whether they are good or bad, that’s something we want to leave for the fans to discover. As with a lot of Treyarch’s characters, the answer is never quite that straightforward! JB: Aside from being a very different story – one that fills a very specific gap in the Aether timeline – the environment has been significantly expanded, with all-new Easter Eggs and quests. So, while players will encounter elements familiar from the original Mob, they won’t have too much of an advantage when it comes to surviving and uncovering the level’s secrets! JB: As with previous games, the arsenal will be largely drawn from other game modes, but there will be some unique additions made as the season progresses. JB: The biggest change to perk functionality comes down to customization. 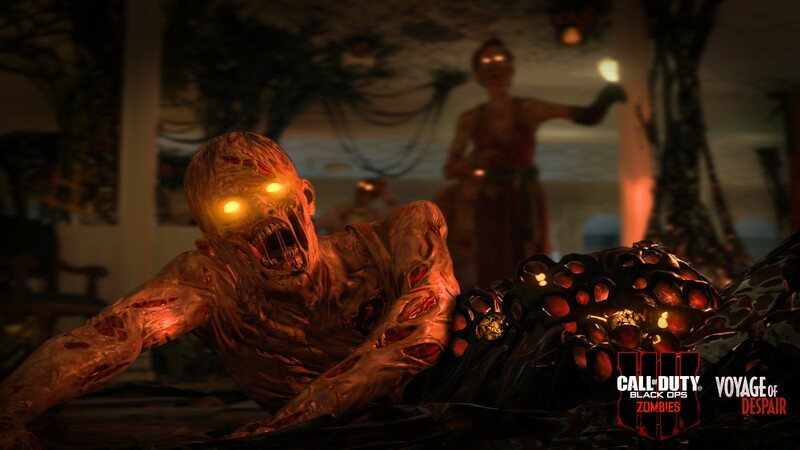 In Black Ops 4 zombies, players will be able to choose the perks that will be available at each of the Altar locations prior to starting the level. This will present some interesting strategies, particularly when it comes to co-op. The Mystery Box is a classic Zombies trope. Will it see any new wrinkles for Black Ops 4? JB: Yes. One example I can mention is that it’s now possible to decline taking a weapon from the box, but offer your team mates the opportunity to take it instead. Voyage of Despair seems to introduce class-based characters for the first time — how do the four different characters stack up? What are their strengths and weaknesses? JB: They’re not ‘classes’ as such, as the characters are all capable of the same physical actions, and weapon handling, so the differences really come from their personalities and role in the overall story. On a similar note: will we see new enemy types that play off the different character abilities? JB: Defeating the new enemy types will indeed require different strategies, but those strategies relate to the actual weapons being used, rather than the characters wielding them. Will Zombies support local splitscreen play? What work is Treyarch putting into the new bot support? Any design goals you can share? JB: We don’t want the bots to play the game for you, so they won’t solve Easter Eggs! They will however allow everyone to experience dialogue and narrative elements that solo players traditionally miss out on. 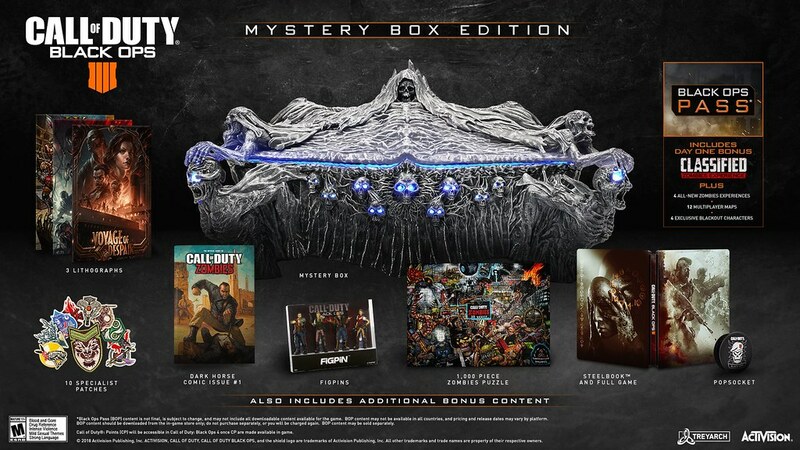 Also revealed during Treyarch’s Comic-Con panel yesterday — the Call of Duty: Black Ops 4 Mystery Box Edition, which comes with a ton of collectible items, a puzzle, Darkhorse Zombies comic, lithographs, Steelbook and more. Click here for more info. Have you guys ever considered taking the practices of other devs by making all maps free and only charging for cosmetic dlc..it seems to work very well, take GTA for example. I was really looking forward to this game especially since I was wanting a new competitive shooter for the season but looks like I’ll have to wait for something else since the practices being made and the fact it seems like a step backwards making it boots on the ground and hand having no wall run. Will there be any changes made to the Afterlife ability that replaced Quick Revive in MoTD? Looks aaawesome! Can’t wait to get my hands on our our recently upgraded to Mystery Box Edition.